Is It Safe To Use Mosquito Repellents For Babies? How safe are various forms of mosquito repellents for babies? 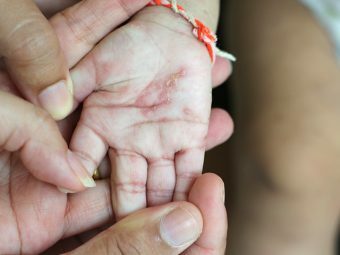 You wake up one morning to be greeted by mosquito bites on your baby’s skin, leaving him red on the nose, cheeks, and hands! It is unnerving for sure. Despite all the physical barriers that you put at home, mosquitoes always find a way into your house to trouble your baby. In fact, it is not just mosquitoes but also other insects such as flies and bugs that may bother your little one. Mosquito repellents work great to drive away any insect, but the big question is whether or not they are safe for the baby. The use of mosquito repellent for infants can become a predicament and it is exactly what we address in this MomJunction article. We guide you through the various types of mosquito repellents and which ones are the safest for your baby. Mosquito repellents come in different forms and packages. Some repellents seem ostensibly harmful to the baby’s health (such as the smoke-making mosquito coils), while some seem to be safe (mosquito bands). We look at these various forms of mosquito repellents and tell you which ones are safe to use for your baby. Let us begin with something that you must never use as a mosquito repellent for your babies. Coils are flattened incense that are burnt to release mosquito repellent smoke. This can effectively drive away insects from a localized area but the smoke can cause respiratory irritation in the baby. If your baby already suffers from respiratory problems, then the smoke from a mosquito coil will surely aggravate the condition. Verdict: Not safe for babies of any age. Besides being a fire hazard, burnt coils release smoke that contains carbon monoxide and other various fumes. These fumes can be harmful to your baby’s health as his lungs are tiny and underdeveloped. Moreover, a study has found that inhaling smoke from one burnt mosquito coil is equivalent to inhaling smoke from as many as 137 cigarettes (1) ! That is surely quite unsettling. The lotions are convenient and portable, and hence are a favorite with many mothers. Mosquito and bug repellent lotions, creams, and gels are topical ointments applied directly to the exposed skin. They also work well in repelling other insects such as flies and crawling bugs because the active ingredient in these ointments usually is DEET, picaridin or IR3535. While these chemicals are effective against insects, it calls for caution. 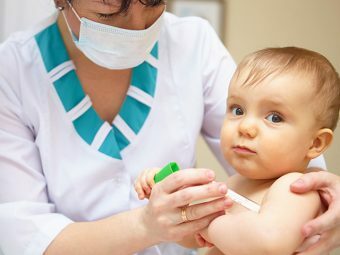 DEET, picaridin, and IR3535 are all not recommended for babies less than two months of age (2). Also, you should avoid products that have more than 30% DEET. In fact, 10% DEET is as effective as 30%; so go for a product that has the ingredient within this range. A study by the independent organization Consumer Reports showed that picaridin is safe for babies (3). IR3535 was also found effective but offered protection for just three hours. Verdict: Safe for babies older than two months when used as per manufacturer’s instructions. Mosquito repellent lotions should never be applied around the baby’s eyes and mouth. Also, do not put it on his hands where there is a risk of ingestion. Always test a small spot on the baby’s skin before applying on the rest of the body. This will let you know if the baby has an allergy to the ingredients used in the product. Do not apply a mosquito repellent cream to a baby younger than two months. Liquid vaporizer and mats are known for their convenience of ‘plug and play’. They use heat to vaporize the insect repellent, which then dissipates into an area. They are generally made of household insecticides allethrin, prallethrin and permethrin that repel insects when sprayed in the vapor form. Allethrin is known to be toxic when it comes in contact with skin, but has little toxic effect when inhaled (4). Prallethrin has low toxicity to mammals (5). Permethrin is said to have similar low toxicity and there is no evidence that it could be extremely toxic for babies (6). Therefore, it can be said that there is no conclusive indication of negative health effects due to long-term inhalation of these compounds. However, the chemicals can affect babies differently than adults. Verdict: Mostly safe when used with caution and after reading manufacturer’s instructions. Avoid using liquid vaporizers and mats when the baby is in the room. Instead, use them before he is brought into the room. Always place the vaporizer away from the baby’s bed, and close to the entry point of mosquitoes such as windows. Do not use it anywhere around babies younger than two months since they can be sensitive even to the slightest amount of insecticide fumes. Mosquito repellent and bug repellent sprays are aerosol-based sprays that contain compounds similar to those present in vaporizers like allethrin and prallethrin. In addition to these compounds, sprays also use the compound deltamethrin, which is chemically similar to allethrin. It has the same level of toxicity as allethrin thus making mosquito repellent sprays quite similar to vaporizers. Deltamethrin is not known to cause any serious long-term effects on usage although babies can be sensitive to it (7). Sprays can work faster than vapors and this is achieved by dissolving the active ingredient (the insecticide) in a volatile solvent like dichloromethane (DCM), or methylene chloride. Long term inhalation of this compound has been linked to carbon monoxide poisoning (8). And that is not encouraging. Verdict: Not safe for babies. Insect repellent sprays may work faster but the chemical can harm your baby’s health. Moreover, most sprays have a pungent smell due to the presence of kerosene, another insecticide. Kerosene is proven to be toxic to the body when inhaled in the form of vapors (9). You find a plethora of essential oils in the market to naturally repel mosquitoes and other insects. They are usually sold dissolved in a topical ointment base and prove to be DEET-free insect repellent for babies. Several homemade and Ayurvedic insect repellents also use essential oils. Although they are natural, they may not be safe for babies. For example, one of the most common essential oil used in mosquito repellents is lemon eucalyptus oil and its synthetic variant is PMD. The US Centers for Disease Control and Prevention (CDC) states that it must not be used on the skin of children below three years of age (10). It is mainly because their skin is underdeveloped to handle the natural chemical compositions of the oil. There are also other essential oils like cedar, lemongrass (known as citronella oil) and rosemary. But consumer study of over-the-counter essential oil-based insect repellent lotions found that these essential oils were ineffective in protecting against insects with the exception of lemon eucalyptus oil. Even if they offer protection, it is for a little time. Essential oils, in general, provide protection against insects for no greater than two hours (11). Verdict: Safe or not safe depends on various factors including the type of essential oil, mode of application (on skin or through spray) and whether the baby is sensitive to essential oils or not. Lemon eucalyptus oil should not be used for children below three years of age, as mentioned earlier. The synthetic version of lemon eucalyptus oil called PMD (p-Menthane-3,8-diol) is commonly found in anti-mosquito wipes for babies. It has the same properties as the natural version; therefore, it can be a potential allergen. When it comes to essential oils like cedar, lemongrass (known as citronella oil) and rosemary, then the usage can be subjective depending on whether the baby is sensitive to it or not. Oil of lemon grass/ citronella is known to be a dermal and respiratory irritant (12). Some babies can be sensitive to the topical version of the essential oil but may not show any adverse effects to the vapor form. Thus always check if the baby is comfortable with the essential oil-based repellent and consult a doctor if you have any queries. Either way, essential oils are never safe for babies younger than two months old. Mosquito repellent patch is like a bandage that is laden with an insecticide. The effectiveness of the patch decreases as the chemical slowly evaporates in the air. Mosquito repellent bands and bracelets work on a similar principle and can be refilled with a small tablet. Fabric roll-ons look like deodorant roll-ons that can be rubbed in small portions on clothes leaving small amounts of insect-repellent. These are all portable mosquito repellent solutions similar to mosquito repellent lotions. There are a variety of mosquito patches and roll-ons available for babies and generally have the same ingredients as in lotions. A patch should never be stuck to the skin or the clothes of the baby. It may should be stuck to an object close to the baby yet away from his reach. Manufacturers of insect repellent roll-ons recommend using it on cots and strollers instead of clothes for babies younger than two years. 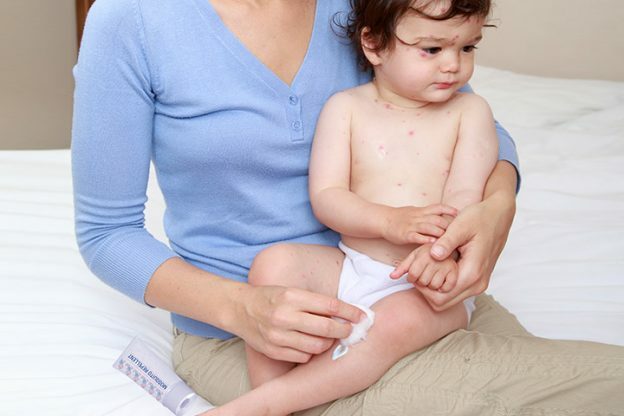 Patches containing DEET or picaridin should be avoided for babies younger than two months old. Many patches contain essential oil as an insecticide and as mentioned earlier, you must be careful about their usage since they can be potential allergens. Verdict: Safe depending on the ingredients. Always look at the label for the active insecticides used in the patch or roll-on. As always, never use these for babies younger than two months of age. Physical barriers are the safest and most cost-effective means of protecting your baby against mosquitoes and other insects. Mosquito nets are one such example that come in numerous sizes and can be customized to meet the requirements of your baby’s crib. They can be used 24 x 7 without worrying about your baby being exposed to any harmful chemicals. Electronic mosquito killers such as electric bats and mosquito trapping night lamps are equally safe as long as they are kept away from the baby’s reach. Verdict: Safest means of repelling insects for your little one. Electrical mosquito repellents should be placed away from the baby’s reach and preferably used when a parent is present in the room. Mosquito nets work great. They are an effective means of protection against mosquitoes and are even vouched by the World Health Organization (13). Nets must be periodically checked for any tears or openings. Certain mosquito nets are sprayed with insecticides and are good but can be avoided since the baby may grab the net once in a while thus causing the risk of ingestion through hands. Mosquito nets are the best insect repellents if your baby is younger than two months of age. Read the instructions and safety information label on the outer packaging of the repellent. This will give you an idea of what went into the making of the repellent and whether it is generally safe for a baby. Never apply an insect repellent around cuts and wounds since it may enter the body. Do not apply an insect repellent on the baby’s face and palm since it can lead to accidental ingestion. 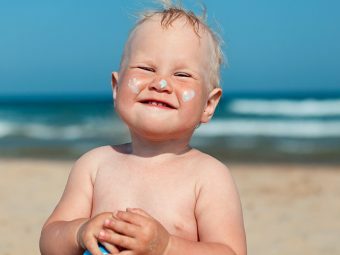 Do not use products that combine DEET with sunscreen. DEET generally reduces the effectiveness of sun protection factor (SPF). This means one may have to apply more sunscreen to protect from sun. This is okay for adults but for babies it may overexpose them to DEET, which is not good for their skin. Always keep an insect repellent, including the outer packaging, away from a baby’s reach. Stop the usage of an insect repellent immediately if you doubt that the baby is showing an allergy (such as rash) towards it. Read the manufacturer’s advice on the packaging for an allergic reaction and also consult your doctor. Wristbands: Wristbands are often soaked in chemical-based insect repellents and sold as effective insect repellents. Ultrasonic devices: These devices claim to emit sound waves of ultrasonic frequencies that can keep insects at bay. Backyard bug zappers: It looks like an electronic lantern with a bright luminescent bulb at the center. When the insect approaches the bulb, it is zapped by the external metal mesh that is electrically charged. Contrary to their claim of being an insect repellent, they actually end-up attracting more insects to your house. Bird or bat houses: Many species of birds and bats are insectivores, which means that they eat only insects. While this may sound an eco-friendly solution, there is very little credibility attached to using birds and bats around human habitats to prevent insect infestation. Garlic or vitamin B1 consumed orally: Another colloquial mosquito repellent hack that has little scientific backing. Remember, insect repellants are meant to keep your baby safe from insect bites but cannot be harmful themselves. If you want to try some home remedies, then you may dab lavender essential oil, diluted with aqueous cream or vaseline, behind the baby’s ears and wrists. If the baby is younger than three months, then you may try citronella essential oil diluted with another oil or water, lavender oil or vanilla essence. However, their effectiveness may vary from one baby to another. Keep the windows and doors closed, especially during that time of the day when the mosquito movement is the maximum. Is there an insect repellent you tried and worked great? Do share it with us by leaving a comment below.